Copyright (c) Marc Dacey/Dark Star Media unless otherwise indicated. Above photo (c) Marc Dacey. Powered by Blogger. About two and a half years ago, I posted my thoughts, immature as they were, on what I suspected was the reality of self-rescue on a sailboat in the middle of the ocean. By "self-rescue", I mean a way in which the solo sailor, having fallen off, can reboard his/her vessel, or how a single and perhaps smaller member of a couple can retrieve the big dope that's slid overboard in the night. It is quite conceivable that if you came up on deck 200 NM offshore to find your PLB-equipped crew missing, you would a) call a MAYDAY on your SSB and VHF, b) hit the EPIRB to get a plane in your general vicinity, and they would c) attempt to zero in on the PLB signal, which is normally weaker and of lesser range than a boat's EPIRB. I was of two minds then, and I remain so today, with a couple of caveats and an evolving suite of MOB devices to blame for the rethink. My original position was, and remains, to stay aboard the boat. Sounds easy, right? Obvious, even. And yet people fall off boats all the time. On the Atlantic delivery I crewed after I wrote the original post on self-rescue and problems I saw with getting someone back aboard in bad conditions, the boat came off an odd and higher wave while the AP was on during my middle of the night watch. I had been watching the stars, so brilliant at sea and had been lying on my back. The boat slid, the cushion I was on slid, and suddenly my feet were under the lifelines and my backside was on the toerail. Then the tether went twang. I stopped my slide with my feet washed by the waves of the sudden, clear-air gusts or rogue waves or whatever the hell it was that threw us over without warning. I was able to quickly haul myself (and the cushion) back, switch off the AP, and actively steer back to our course. By the time the skipper appeared, all was well and I had re-engaged the AP. But it was a lesson or a warning. I never failed to tether on in the Atlantic when on solo watch, because intellectually I understood that the likelihood of finding someone on a moonless night with 10-12 foot waves was pretty low. I could be pretty far astern, and injured, before anyone found me. The PLB might...might...have helped, but we were between Bermuda and the USVIs at about 63° West, and likely beyond SAR aid. Past Bermuda, I saw two ships, at a great distance. Maybe. Could've been a UFO. So stay aboard. Don't cause your friends, or SAR personnel, or even your crewmates to play what I grimly termed "spot the corpse". Believe in your saviours: the tether, one hand for the ship, the PFD and the Personal Locator Beacon...wait, what about that PLB? The manual operation aspect is an issue, as well: If you are knocked out or have broken fingers (not a crazy assumption if you were knocked off the boat), you are going to have issues activating some of these units once in the water. It's a two-hander job. So are the new style of near-range "life tags" the way forward? That depends, I think, on comparing features. I don't know if devices like these are practical, but as we creep closer to our own ocean adventure, I do consider them in the context of overall crew safety at sea. While I agree that the majority of sailing done is coastal and within reach of such SAR resources as may exist, I am thinking specifically of offshore use, where the distance exceeds the range of SAR personnel, and the odds of a person being alone at the helm in the middle of the night is greatest, and it is this possibility of having to be the only possible rescue vessel in the area that I am thinking of. The short form is that these beacons incorporate AIS and DSC signals to aid boats in turning around and locating people in the water. They can sound an alarm if the wearer gets more than, say, a boat length away from the AIS. It's interesting, even if the two-mile range seems short to me. Obviously, it's only for multi-person crews able to physically retrieve people from the water, which means that a) there's a ladder or Lifesling or other means of getting them aboard, and b) they aren't so injured that they are unable to aid in their own climb back on deck, and c) conditions allow coming alongside a person in the water without slamming them further or chopping them to bits with the prop. Point goes to staying aboard. On the other hand, with a "proximity beacon tied to the AIS, you know if somebody is off the deck very quickly. Even if they are passed out and have a broken arm, guaranteeing a hard recovery, the search aspect would be the smallest part of the operation. That aspect is better this than waving a sputtering penlight, I suppose. Yelling is right out. Anyone who's tried to shout from an aft cockpit to the bow where the anchor handler is knows this is true. On the other hand, in a heavily trafficked area such as Lake Ontario, I actually would prefer what I already have: a submersible VHF with which I can directly shout MAYDAY on Ch. 16. My Standard Horizon 850 gives me not only a radio that can float/take a dunking, but can also give me a lat/lon thanks to an integrated GPS. The likelihood on a summer's afternoon near Toronto is that I would be hauled out by another boater monitoring Ch. 16 and halfway back to my own boat before I saw the yellow helicopter. a) all crew on deck are wearing these devices at all times. b) the devices themselves are always charged and functional, meaning they are "always on" in a sort of "guard mode" until lack of proximity to the AIS transceiver sets them to "active mode". c) that you keep your AIS on continuously in order to hear the alarm. It may be the case that the ideal solution is for a PLB/GPS combined with a two-mile COB beacon, allowimg the greatest number of options for "self-rescue" or thanks to the more typical guys with the slings in orange helicopters. I wonder if a simple clamp and extending, brightly coloured pole (like the sort on bicycle carts) on the PFD would increase the visibility of the COB and, if the beacon was on the top of a two-meter pole, would the range of the beacon then be much greater than two miles? I understand also that some PFDs inflate a "soft danbuoy", a sort of inflatable, brightly coloured plastic pole that deploys off one shoulder. That seems like a good idea, but would be only marginally better at night. That "laser flare" is looking good at this stage. Certainly, what I currently have is enough for Lake Ontario (mostly) fair-weather sailing. But I follow developments with interest, as do I check up on the international standards. This AIS-SART technology looks promising, but is it translatable to the self-rescue set-up we are discussing? Dunno. Must learn. Maybe this would serve. It calls your VHF using Channels 16 and 70 via DSC, providing a set of GPS lat/lons. It also has a strobe and can be water-activated. The "old school" trailing floating rope is an old trick from the days of cork-filled "life belts". I have read of a couple of cases where it worked (for obvious reasons, you don't hear about when it doesn't work). A refinement of this idea is attaching this trailing line via shock cord and a sort of pin and block to the control lines of a wind vane. The weight of the line is not sufficient to pull the pin, but the weight of a body on that line, being dragged at several knots, is. You pull the pin, the wind vane is disengaged, and the boat (hopefully!) rounds up. You haul yourself forward and hope you were clever enough to buy the sort of folding ladder you can deploy from the water's surface. Again, you have to be fit and largely uninjured and conscious to accomplish this. If you've ever been towed behind even a dawdling sailboat, you know you'd have to possess considerable arm strength to pull yourself forward. Adrenaline might help, but if the water's not tropical, not for long. You could rig this "release and round-up" to a jib sheet, too, but I would have to look up how that works in the old 'single-hander' books I have. It might be only suitable for dinghies. Needless to say, these methods are in no way guaranteed, but if I was single-handing on the open ocean in relatively easy conditions, I would consider trailing a floating line aft. It wouldn't induce that much drag, and it's cheap, if "last chance" insurance. It's an interesting topic, to say the least of it. People who "self-rescue" get to tell their stories. Rarely is a single-handed boat found adrift and uncrewed in which it's clear how the skipper departed, or why. UPDATE, 2013.04.13: Of course, all these gadgets are predicated on being hauled back aboard in a timely manner, and from water that will slow the onset of hypothermia. Given the time of year from where I'm writing (early, fitful and sleety Spring), a reality check on falling into cold water is relevant. A couple of article by the excellent Mario Vittone on the equally compelling gCaptain website are worth linking here for the reality of hypothermia's role in complicating self-rescues, or indeed any rescue. The Truth About Cold Water: A grim but honest examination about some of the myths concerning what a person can and cannot hope to do once off the deck and into the cold sea/lake. In my recent Marine First Aid course, we learned a bit about cold shock and cold incapacitation, and a little bit about post-rescue collapse. But I haven't been trained as a paramedic, just as a first responder of the most basic (and perhaps only) kind available. All I can do is be aware of these factors if a person I can retrieve is appearing hypothermic. Drowning Doesn't Look Like Drowning: Just as movie heroes seem to have infinite bullets, and Batman's sustained more concussions than a thousand Sidney Crosbys, so many of us have a rather fixed idea of what drowning looks like. This idea is completely wrong, according to Vittone, and you do learn the truth in a proper marine first aid course. UPDATE, 2013.05.06: Thanks to sailor and long-time reader John Cangardel for sending me this, which I suspect is based in part on a prop from a James Bond movie. Interesting how at 1:43 the helo spotted him on the infrared...in the daytime. But I cavil. This is, like, the Garmin Quantix I mentioned earlier this year, a bit of a paradigm shift in PLB form factors. Interestingly, it's orientated to calling in rescue resources from afar, not the "self-rescue" discussed above. Is this therefore of most use to solo sailors? No, Mr. Bond, I expect you to drown. The Breitling Emergency II model is interesting to me as it shows the convergence of certain types of wearable beacons with pricy, if more quotidian items like watches or brooches, et cetera. Clearly, the day when we have a combination radio and beacon of the Star Trek "communicator" type cannot be very distant. 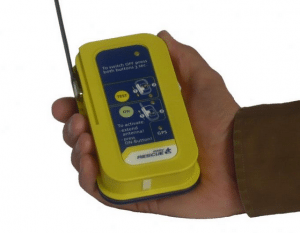 Certainly the widespread popularity of the far, far cheaper SPOT Messengers is a harbinger, and while the SPOT beacons have some shortcomings, they are a terrific and low-priced adjunct to proper emergency beacons; even the daily "I'm OK and here's my lat/lon" message from vessels on delivery is useful to loved ones while one is offshore. If you sink this close to shore, skip the beacon and just get out and walk. To my knowledge, there isn't (yet) an AIS-SART in a watch that would alert people that you've fallen off the boat and are bobbing on a bearing of 271 T. Why would there be? Increasingly small devices, now down to not much bigger than a couple of packs of gum, do that already. And yet a watch has the cultural heft of a customarily worn item of "clothing", and doesn't look like a conspicuously bright piece of plastic rescue tech. It looks like a very expensive watch, which, if one is relieved of it through robbery, might reveal the location of the thieves, if only by them fiddling with it! According to this, the Emergency II will transmit for 18 to 24 hours. I am guessing it is both 121.5 and 406 Mhz because neither transmission contains a GPS string. I think an EPIRB with GPS wins in this regard, plus a SART for the last few miles. I am also a little suspect at the length of time it will broadcast. Hit a container in the South Pacific and you could be in that raft for a few days, even with a working EPIRB and your location tracked via COSPAS. Interestingly, COSPAS-SARSAT frequency issues are discussed by Breitling, who maintain that the analog 121.5 Mhz signal is still valid for final "homing in". I also question the need to secure the watch to the top of the raft (bring a C-clamp in the ditch bag, perhaps? ), although clearly one cannot deploy the antennas and continue to wear the thing. I can see this being of some use to hikers, mountaineers and back-country skiers, perhaps...the sort of people unlikely to carry an EPIRB or even a standard PLB (although that is a good thing to consider if it's the 406 Mhz GPS transmitting kind). Nonetheless, even a fifteen-grand, short-lived beacon you can wear will appeal to some. Not me, however: I wear a worn Suunto Vector with a cracked crystal, said crystal getting cracked in the first place because the Vector is somewhat chunky; the Emergency II is even larger and heavier. I like my old watch's barometer feature, however. but am considering switching up to a Suunto Core, which has a "storm watch" alarm feature some sailors have reported useful to them in getting sail off before bad weather hits. Dorky, yes, but I don't have to lash it to the top of the raft to use it. I can acquire one of these for $250. Of course, many sailors say you can get a perfectly fine Casio for under $50 and not worry. Others go completely "island time" and lose the watch entirely. That's fine, too: I didn't wear a watch except for suit gigs until I got the Vector for sailing use. I use the barometer function a great deal and that feature alone is attractive to me. For fifteen grand, however, the Breitling Emergency II would just make me more nervous than the possibility of stepping off into the raft. I also can't help but reflect that I could spend the same amount and could ballast the liferaft with EPIRBs that would last a month. Note that I would not in fact spend that amount. That's also about four very nice liferafts. This German-made AIS beacon starts transmitting when the PFD inflates, which is handy if you are unconscious, but alive, when you fall off the boat at 0300h. UPDATE 2015.09.12: As predicted, it seems that the utility of adding AIS to a wearable device attached to a PFD (along with laser flares and other "here I am" devices, is proceeding apace. 'The smaller person retrieving the big dope who slid overboard'. Do you have any particular person or persons in mind, Rhys? A USCG officer told me that the No 1 cause for men falling overboard was from urinating over the side. The people at Pelagic, who do a lot of extreme latitude sailing, recommend the use of a pee bottle. Does it make sense to you? I have heard that "skipper's privilege" is the Number One cause of Admirals having brief widowhoods before a new Skipper. Realistically, I have to consider all options. Years back, not only was I lighter, I had a girlfriend who was 6' 2 1/2" tall and only about 30 pounds lighter than me. Think of what I could have saved on a deck crane. As for the "pee bottle", the outside sailing helm has two four-inch scupper pipes angled aft. Problem solved...after a bucket of seawater or two. I like Pelagic a lot. I've stolen a few ideas from that particular boat, along with a few other Southern Ocean "steelies". One idea was a large reel of "flat" webbing mounted on the arch. It was taken to shore in various Patagonian williwaw-afflicted fjords, and the bitter end was cleated off to the stern quarters. The effect was a three or four point securing to shore where the depth made anchoring difficult or perhaps problematic and in a place where the wind could fall off the mountains from any direction at 90 knots with little warning. "Break out the good rum, dear...it's getting brisk out here!" Canadian sailors can find pee bottles perfectly contoured for both sexes in Canadian Tire and every supermarket. They're those oval-shaped milk pitchers which Canadians use for dispensing milk from clear plastic bags. We've used them on Silverheels III since 2003. Whenever we visit Canada we mule six pitchers back to the Caribbean to dispense to American and other foreign boats. They're very popular here. Silverheels III is considering one of these units for both diving safety and for our helmsmen to wear while at sea. Silverheels III: The Nautilus Lifeline is a smart concept for divers and for boaters, provided there are people listening to their VHF within a 12 mile radius, which is highly likely in most of the Caribbean. Apart from CT milk jugs aka pee bottles, I wonder what Caribbean sailors want to receive from visitors? I heard coffee from Timmy's was on top of the list. Is that right? What else is on the list? Nice, and dual-function in that it works some distance below the water, and so it's useful for sailors who also dive, which has to be a large percentage. I would be interested to learn if that eight-mile range is noted at the surface and what the range is a couple of dozen feet down. Maybe this is classed as a beacon you can talk over, rather than a handheld VHF with an enhanced beacon function, and so it exceeds five watts transmit power. In other words, I'm trying to distinguish this from a regular VHF/DSC radio that is submersible to three metres beyond the fact that it will work at 100 metres. That's sufficient in and of itself to me, however. It still requires you to be conscious, however, unlike a proximity beacon of the "Lifetag" type. Re: the milk containers. Sea Pees? I had to explain the concept to Becky. Like me, she had no idea milk bags and their required jugs were uniquely Canadian. So do you run a lanyard through the handle? Under the circumstances, I'd run a bushing, as well. A small plastic jug of seawater is kept in the cockpit to rinse the milk container. We wouldn't care to be filling buckets over the side while alone in the cockpit on a night passage. Too risky. The emergency radio device that I was referring to works on the surface. An underwater VHF signal is not going to be heard by anyone. I agree. Defeats the purpose somewhat. I was joking about the bushing. Somehow I thought it would reach the surface (my ignorance of the VHF frequencies is showing) if you got stuck while diving. So basically, it's a regular VHF/DSC handheld inside a pressure-proof, waterproof housing? Isn't Jamaican Blue Mountain available? Probably cheaper than here? The only time I'd had Timmy's is while riding shotgun in other people's cars driving to a campsite or something. I wouldn't miss it while cruising. I can't think of what I'd want that's Toronto-specific if I was cruising the Caribbean. I could read the Globe and Mail online if we had Wi-Fi. Cruising is all about NOT reading the bad newz in The Mope and Wail. Cruising is also (in our NSH opinion) getting away from the everyday things that one does in Canada. Frankly, Tee-Ho's coffee isn't really that great. It's merely...predictable. We believe that Canadian drivers are brainwashed into thinking that it has great flavour. We appreciate really good coffee from Jamaica or South America; freshly ground in the saloon every morning and brewed in a French press from with deck-gathered rainwater. We purchased 10kg of beans from a mom & pop roasterie in Antigua last March. We'e now stretching it with locally available beans here in Grenada. Canadian cruisers will appreciate the following hard-to-get items from home: Ju-Jubes from Costco, #1 light grade maple syrup in glass, Gillette Good News razors in ten paks, Gillette clear gel transparent anti-perspirant, fresh crisp Canadian apples, AA and AAA batteries, Canadian Tire camping dept yellow-coloured plastic egg crates, plastic pot scrapers,replacement battery packs for the laptop PC, Adidas Polyester dri-weave tee-shirts, Tilly hats, replacement steel twist drill sets and superior quality RG8U or RG213 coaxial radio cable, adhesive-lined heatshrink electrical wiring terminals and...Honey Brown Ale from the Amsterdam Brewery on Bathurst Street in Toronto. Superior coffee? We have plenty of that! After all, much of it comes from down here. We come from slightly different perspectives, Ken. You had a salaried day job for decades, and may be the youngest person left to receive a reliable pension from it. I've self-directed my investments since I was 20 and have worked as a full-time freelancer (with occasional shots at paid employment; the last in 1999) for almost as long. I've never really *had* an "everyday" to compare against. And I was raised on tea like a little British kid. I didn't drink coffee until I was 25, and that was from Timothy's, where my girlfriend of the time was a manager. Tim Horton's, by contrast, was a shock. So is Starbucks, nasty burnt stuff that it is. In my view, if you have to put stuff in coffee to disguise the taste, it's time to switch brews, or to switch ways of preparation. As a side note, I would be interested to hear what kind of coffee you buy for SHIII's mornings, and for what price, and in what quantities. How do you store it to keep the beans fresh? How do you know it's been roasted recently...look for the puff of smoke on shore? Coffee has become an important ritual for me, and yes, I'm pickier about it than I am about many things. "[The sea is] neither cruel nor kind ... Any apparent virtues it may have, and all its vices, are seen only in relation to the spirit of man who pits himself, in ships of his own building, against its insensate power." My wife, my teenaged son and I plan to start voyaging in June of 2019 for an estimated five to six years. I hope to move us aboard before that point to work out the kinks of living on a boat. The careful reader will note the URL of this blog has "alchemy 2009" in it, a reference not only to our boat's name, but also to the original, anticipated departure date. This is called "tempting the gods of the sea and life in general" and will not be modified. You have to know when to fight, and when to appease. Frankly, it matters that we go, not when we go. This is a good lesson for all aspiring voyagers, I think: the hubris of long-range planning lurks like an evil watermark on every "to-do" list. Here you will find various notes on our preparations, labours and education as we try to become better sailors in a good old boat. I hope to continue to discuss in this blog the realities of preparing for a marine-focused extended sabbatical, the issues both mundane and philosophical confronting the potential cruiser, and the efforts required by everyone involved to make it happen. Also, here is my current sailing resume. Please note that all text and images on this site are copyrighted and may not be used without permission of their respective authors and creators. Please note that I have not bothered to resize photos and they may be seen at full size and aspect ratio simply by clicking on them. Some photos formally hosted on third-party servers are not at present appearing; I will locally host these photos as I can afford the time to relink them. Please also note that anonymous comments are usually spam and will typically be deleted without reading. Author's text and most images other than product shots specifically created by product manufacturers are copyright 2006-2019 M. Dacey/Dark Star Productions. Photos sources linked from online news and related organizations are copyrighted to their creators. When is a skipper a captain? The most convincing anchor test ever! 59 North: A Swan 48 you can charter! BoatBits: Tidbits, but with salt. Boatman Phil's Yacht Deliveries: When you're too busy to sail your own damn boat. Lloyd's List: Has something sunk in my general direction? 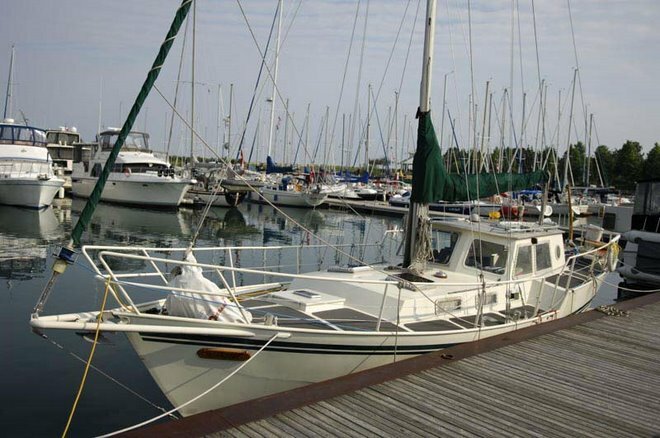 S/V Momentum: "The Motorsailer Project"
S/V Obsession, a Beneteau 305 out of P.E.I. S/V WhiteBird: How bad could it get?